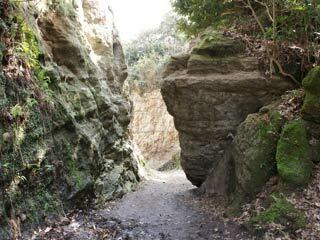 The Nagoe Pass (名越切り通し, Nagoe kiritoshi) is located on the south east of Kamakura. It is less than 2 metres wide, is one of only seven important passes into Kamakura in ancient times. 1. use Local bus to Nagoe. An historical landmark, the Nagoe Pass, which is less than 2 metres wide, was one of only seven important passes into Kamakura in ancient times. The Nagoe Pass was important for fishermen because it linked Kamakura to the Miura Peninsula. It's name was originally written with the characters 難通 (hard to pass) because it was so steep and narrow. While it was possible for people to walk through in a single line, it would have been difficult to pass through carrying equipment or with a horse laden with gear. "Once the Kamakura shogunate was established, to allow trade during peacetime and defense in case of war, it opened seven passes. The Nagoe Pass still remains close to its original form. On the Zushi side, in several points along the road are still visible the remains of artificial cliffs added to complement the place's natural geography and ensure an easy defense. - March 1981, The Kanagawa Committee for Education." During the battle of Kamakura in 1333 the Nagoe Pass was defended by Akahashi Moritoki.